THAT the automobile industry, at least, is on the way up is indicated by the fact that production in the year 1934 was 45% higher than that of 1933, and double that of 1932. 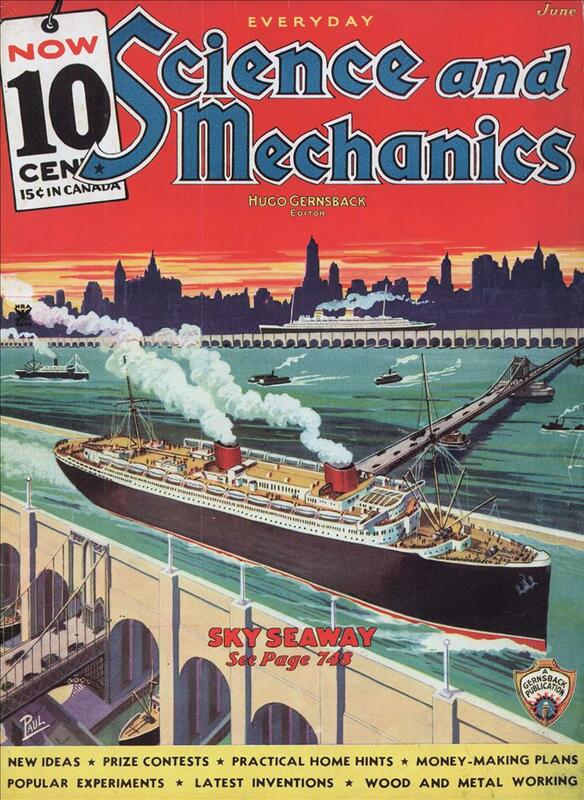 The motoring public spent for new cars, accessories, replacements, gas, etc. including taxes, more than $5,000,000,000 last year. A third as much more was expended on highways and streets for the motor traffic. The figures, in fact, are a bit astronomical. Nearly 2,300,000 cars and 600,-000 trucks, if we exercised the fanciful privilege of rolling them into a pair, would stand nearly topping the skyline of New York. Several skyscrapers could be drowned in the barrel of gasoline; in fact, cutting a few windows in the can of motor oil would make it one of the country’s largest buildings. 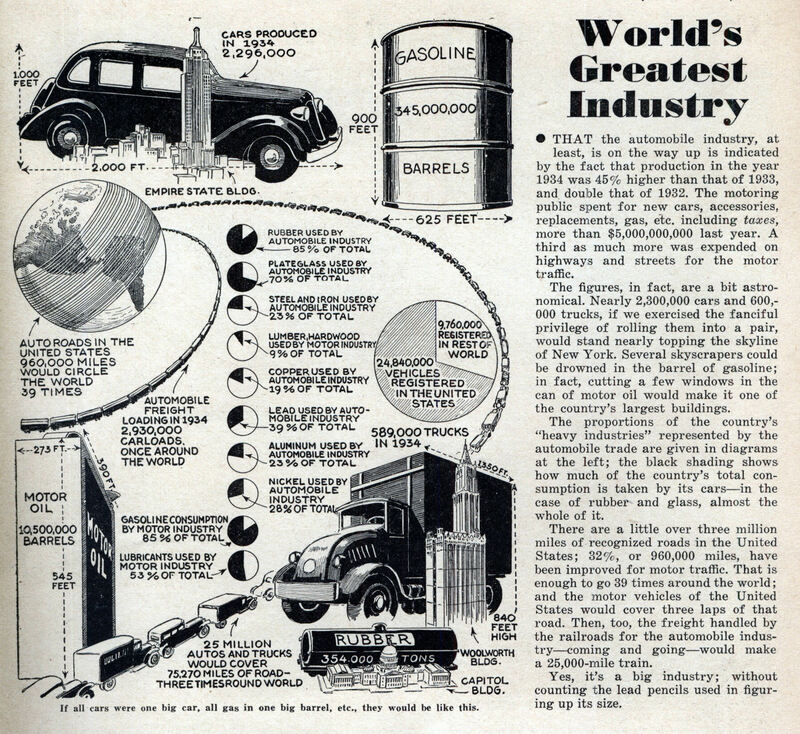 The proportions of the country’s “heavy industries” represented by the automobile trade are given in diagrams at the left; the black shading shows how much of the country’s total consumption is taken by its cars—in the case of rubber and glass, almost the whole of it. There are a little over three million miles of recognized roads in the United States; 32%, or 960,000 miles, have been improved for motor traffic. That is enough to go 39 times around the world; and the motor vehicles of the United States would cover three laps of that road. Then, too, the freight handled by the railroads for the automobile industry—coming and going—would make a 25,000-mile train. Yes, it’s a big industry; without counting the lead pencils used in figuring up its size. Yep it was great until the Japanese took over. The Unions finally brought the US auto industry to its knees. Union ‘rules’ made the price of making cars in Detroit nearly impossible. No wonder there was assassination and thuggery as part and parcel of unionism in America. Speaking of thuggery, a full 12.5% of my property taxes go to automobile-related items (car-only -roads, city parking lots, health issues, etc) and I don’t even own a car. The Century of the Car isn’t over yet – will we survive it?